Jesus encounters this guy in Mark 12:28-34 in the form of a scribe who is perhaps testing Jesus or just wanting to give himself an opportunity to show off his knowledge. “Which commandment is the greatest of all?” After Jesus explains that the greatest commandment to be trumped by no other is loving God and then loving your neighbor, the scribe fulfills his role nicely and commends Jesus for his astutely erudite answer. But then, Jesus throws the curve ball. Jesus very well could have been complimenting the scribe here, but I think he was making a point – “You are not far from the Kingdom of God.” Well said grasshopper, but you’re still a little short. Close, but no cigar. Just like those who Jesus had encountered in the previous couple chapters in Mark, there was something lacking. Something kept the inquirer from having it all figured out. Before every season, that famed coach who used to lead some team up north, what’s his name again? Oh yeah, Vince Lombardi would hold up a football and say to the team, “This is a football.” That’s it. Plain and simple. He was talking to a team of players who had practically been born with a football in their hands. These guys had played football since they were old enough to stand on their own two feet and Lombardi was telling them something so obvious that it could have been insulting. But that is the point. Lombardi wanted this team to understand that it is the obvious things that win games. It is the simple fundamentals that get you to glory. Head to the outside when you tackle. When you block, it’s middle, inside, linebacker. When you are playing corner, your responsibilities are to defend the receiver, then contain the outside, then go to the middle for the tackle. And so on. This same penchant for missing the obvious is what Jesus was talking about to the scribe. He in essence stood in front of this man and pointed at himself and said, “This is love.” It wasn’t good enough that the scribe understood intellectually what the commandments were. He actually had to do them. But Jesus was saying something even more profound than this. He was saying that if you embody love to those around you, the kingdom of God will be right here! We spend a lot of time with our heads tilted to the sky waiting for Jesus to come back and make everything better. But we miss the obvious. When Jesus stood right here on this earth he told us, love one another and embody that love and the kingdom will already be here. This Sunday we celebrate All Saint’s Day. 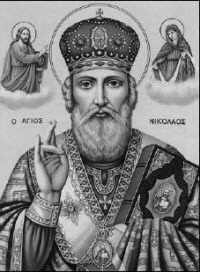 It is said that St. Nicholas was a great example of what it looked like to embody love. In the time that St. Nicholas lived in the fourth and fifth centuries, it was common for the father of a daughter to pay a dowry to a suitor so that he would marry his daughter. The higher the dowry, the more likely the daughter find a husband. If a daughter did not find a husband, she would have to be sent in to slavery. One story says that there was a man who had three daughters. The man was very distraught every day when the third daughter finally reached marrying age because none of his daughters were married and being a poor cobbler, he did not make enough money making and selling shoes to come up with a dowry for one daughter, let alone all three. It is said that St. Nicholas, then the Bishop of this area of Turkey, secretly left three bags of gold in the shoes of this old cobbler so that his daughters would have a dowry and not be sent into slavery. He placed these bags of gold anonymously expecting nothing in return. He just did it because he had love for other people. Is this story true? Did it really happen? I don’t think it matters. We are smart enough to know that acts of selfless love can bring a little bit of heaven right here on earth. The only problem is . . . where are the saints? Who do we turn to as the world around us sometimes seems to be falling apart? Where are these saints who will make the Kingdom of God appear before us? See the reflection in your computer monitor as you read this? See the face looking back at you? Yep, you get my point. Let’s go out and be saints to those around us because we have a love that is so deep and so strong that it oozes from our pores and we can’t contain it. I guess there is still hope for this world . . . This entry was posted on November 2, 2012 at 5:43 pm and is filed under Uncategorized. You can follow any responses to this entry through the RSS 2.0 feed. You can leave a response, or trackback from your own site. I used to think of love in the dictionary sense — to mean “strong bonds of affection” — with the greater the love suggesting the greater the affection, the stronger the bond; whether it be romantic (as I love my wife) or familial (as I love my parents and my siblings) or platonic (as I love my closest friends). Is it enough to be kind, to be nice, to have good intentions, to try to do good, to lead with honey instead of vinegar. Is it enough to love all of God’s children — irrespective of race, ethnicity, or preference. Or, as I now suspect, perhaps have always suspected, is something more required, something tangible and sustained. Given the inspirational example in this writing of St. Nicholas, I sense the latter, and hope that I hold such compassion within me, and generously act.